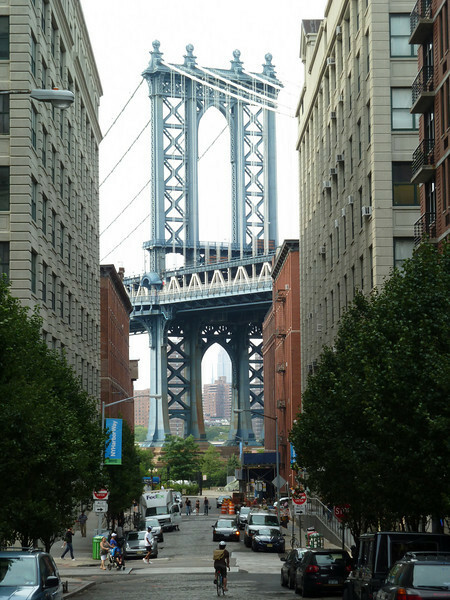 View of Manhattan Bridge from DUMBO (Down Under the Manhattan Bridge Overpass) in Brooklyn. This was just a quick shot. I will get a better one of this using my D90 and taking my time so I get the cables on the bridge. REcognized this view immediately..entering the contest that is going on for capturing shots of Brooklyn? Can't remember who's sponsoring it just now, though! Great shot! Beautifully done, reminds me of Atget! I love this perspective! I don't know where they film Rescue Me, but it reminds me a bit of a shot they show in the opening credits. I like the perspective and the street details you included. Awesome bridge.